Like all good things, our trip too came to an end. After a full day in Big Sur and Monterey we arrived in Santa Cruz just as the sun set. Cam had put us in touch with a friend of his who lives in the woods just north of Santa Cruz in a secluded house where he had grown up. We thought we’d just clean up and pass out, but by the time we had unpacked the car and reorganized our stuff for the forthcoming flight back to the East Coast, our host had brought back a massive sushi order and several other people showed up at the house. Even though we had only slept a couple of hours the night before, we stayed up late into the night. The next day — our last in California — we drove up to San Francisco. S caught up again with Amira while D made a quick stop at Amoeba Records. A decade ago — when D last visited San Francisco — Amoeba seemed like a mecca: a giant music warehouse that traded almost exclusively in used and resold music. He was very much looking forward to going back, but the visit felt underwhelming. The trend towards digital music media had taken its toll in the intervening years and D struggled to find CDs that interested him. After flipping through about a hundred copies of the same Sting, Tori Amos, and Seal albums, D was forced to call it quits. 2701 — The miles we put on the car could have almost gotten us all the way back to the East Coast had we driven cross-country. Our rental car barely made it — towards the end of the trip, the ‘change oil,’ ‘low tire pressure,’ and ‘low gas’ indicator lights were all on at the same time. $5.15 — Though we avoided filling up in Gorda, where gas was close to $7 a gallon, we were forced to put a couple of gallons into our car in Big Sur at $5.15/gallon. In the Central Valley, we paid almost two dollars less. 5408 — We have yet to begin sorting through the pictures we took on our home leave, which should keep us reliving this trip for many more months to come. 14 — The number of national parks, forests, and wilderness areas we visited. 9,100 feet — Gem Lake is the highest point to which we hiked. At 282 feet below sea level, Badwater is the lowest point we visited. 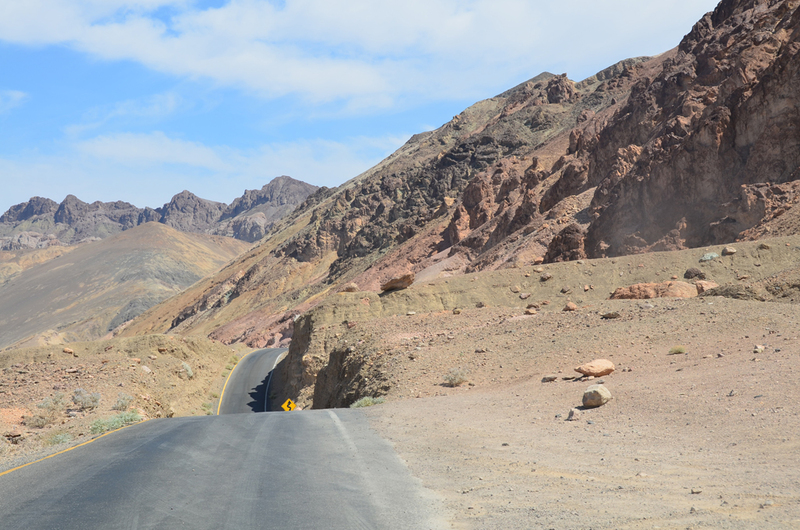 109 — After a full morning of touring around Death Valley, seeing the temperature dial hit 109°F nearly made us wilt. On either side of our visit to Death Valley, we camped high up in the Sierra Nevada, where the temperature was in the 40’s at night. 10 — Not counting the night we slept in our car, the number of different houses, hotels, and campsites where we spent the night. Not only did we see and do a whole lot of awesome, but we also caught up with many of our West Coast friends and made several new ones, who graciously hosted us in their homes. We were a little sad to leave the road, but thankful that we were only midway through our travels. The flight from San Francisco to DC was only the fourth of twelve we would take on our home leave. Love these three photos. What am I looking at and where are they? Hey Whit, thanks! 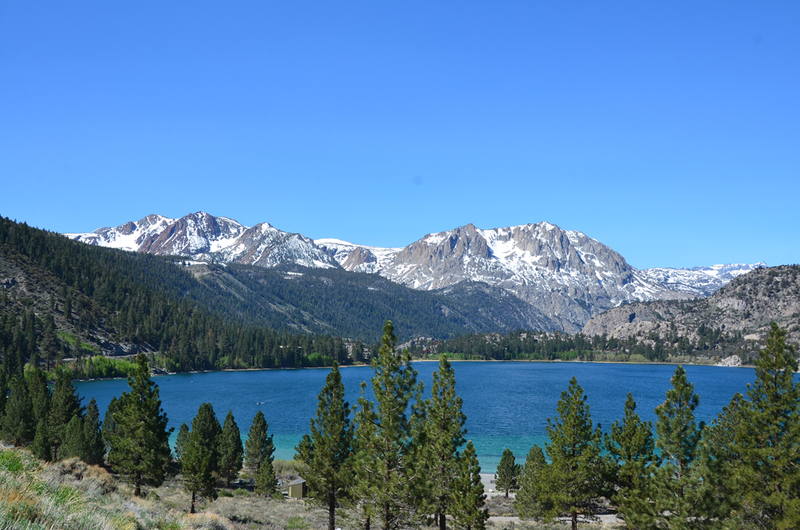 The first picture is of June Lake, on the eastern side of the Sierra Nevada, where we camped for three nights. The second is from a particularly dippy section of the Artists’ Drive in Death Valley. 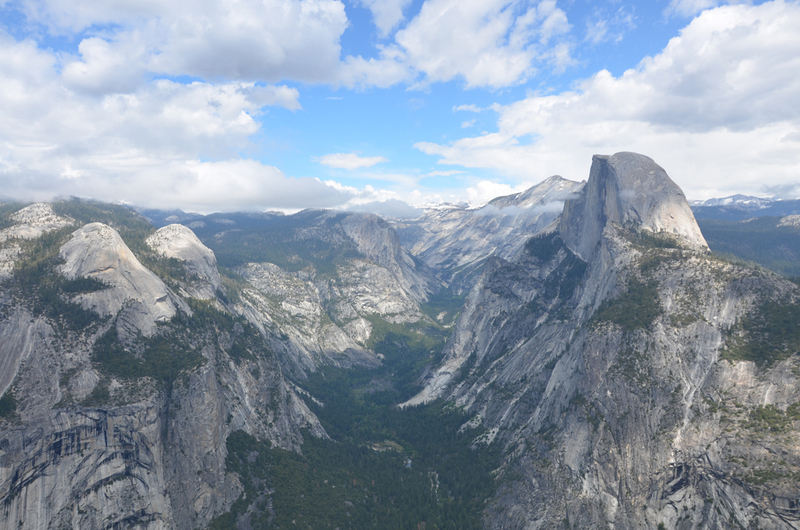 The third is the panorama view of Yosemite Valley from the lookout at Glacier Point, with Half Dome towering on the right side of the frame. We saw a lot of incredible scenery in these three weeks, but these three places stand out particularly. Each one has its own post (or several) with lots more pictures on our blog. I thought that was Half Dome! Though I’ve been working so much lately I haven’t got out much, but I got really addicted to rock climbing this last year. So now I drool over granite or rock or boulders and imagine what it would be like to climb them :) I LOVE reading about your adventures and so glad you’re both doing so well. Your blog will be my travel guide when I do my cross country trip someday, ha. There’s a book we saw recently you would really enjoy, Whit. It was a collection of photographs from the seventies of California’s rock climbers who pioneered many of the ascents on Yosemite’s impossible looking sheer granite walls. It’s called “The Stonemasters” – check it out; it made us drool and we’re not even rock climbers. Thank you, glad you enjoyed the blog. Unfortunately, we’re no experts on the West Coast. This 3-week trip was the first time either of us had a chance to really explore that part of the country. That said, the Petrified Forest looks really cool and should be pretty close to Flagstaff. Obviously, the Grand Canyon is close, but we’re sure you didn’t need us to point you there. :) Enjoy your stay. Your photos are amazing. Pardon my curiousity, but were these touched at all in post-production? Thank you! No, the only post-production we do as a general rule is cropping, but we haven’t even had a chance to go through our pictures. We just picked out the handful of images we really liked for the blog posts and resized them.